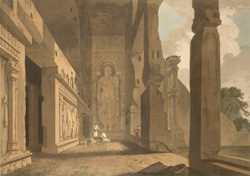 Plate 4 from the fifth set of Thomas and William Daniell's 'Oriental Scenery' called 'Antiquities of India.' The entrance porch to the hall at Kanheri is framed by columns with inscriptions on their shafts. This part of the cave was excavated about AD150 fgor use as a Hinayana Buddhist chaitya hall. The gigantic figures of Buddha at the end of the porch were added in the 5th - 6th Centuries when the caves were reoccupied by Mahayana Buddhist monks, and more was ornamentation added. Between the portico and the outer steps there are two octagonal pillars, the one on the right is topped by a capital made by a group of lions.